The car insurance information I received from the person who hit me does not have his name on it. Are they still going to provide him with coverage? How can I get my damages paid for? The police officer did not report my car accident accurately and has me at fault. What can I do? I was pushed into a car in front of me. Am I at fault? After someone is rear-ended, it is very common for that person to get pushed into the car in front of them, even if they were at a complete stop. If you were rear-ended and were pushed into the car in front of you, you were not at fault. The person who rear-ended you is at fault for all of the damages to you and your car and the damages for the person in the car in front of you and their car. It does not matter how far you were from the person in front of you. For example, if you were only one foot behind the person in front of you and were pushed into that car, you do not have to pay for that person’s damages. The person who rear-ended you is responsible for all of the damages from the crash. 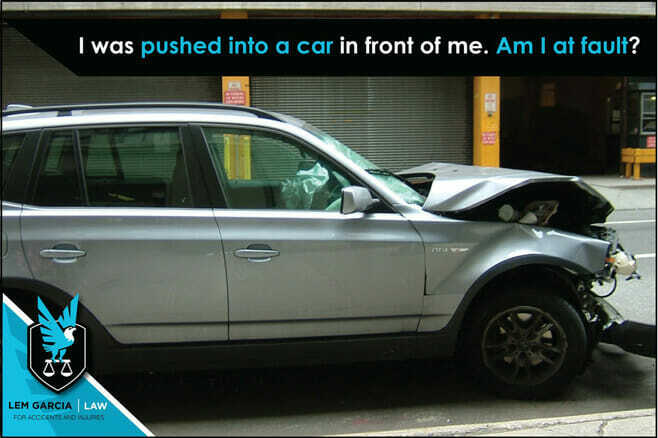 You can run into problems if the person you rear-ended claims that he felt two impacts. If he says he felt two impacts, it means that you rear-ended him first and then the person behind you rear-ended you and pushed you into him for a second impact. If it turns out to be true that you rear-ended the person first and then you were rear-ended and pushed into him again, then you and the car behind you are both responsible for the other person’s damages. The two of you would share fault, but most of the liability would go to you. If you find yourself in this type of situation, it is important that you take photos of all of the cars involved and of the scene of the crash. These photos will help your attorney prove who was at fault for the crash. If you do not have an attorney, you should get one because the insurance companies will try to point the finger to anybody excluding their own insured to avoid having to pay the claim. When car accident victims are unrepresented, insurance companies often try to take advantage of them because they know they can and it will save them some money. When you are represented by an attorney, it reduces insurance company game-playing. If you were involved in a car accident and need a car accident attorney in West Covina, call Lem Garcia Law. We help you maximize your recovery and minimize your stress. Our goal is to make the aftermath after an accident go as smoothly as possible.